Everyone recognizes a roasted coffee bean, but you might not recognize an actual coffee plant. Coffee trees are pruned short to conserve their energy and aid in harvesting, but can grow to more than 30 feet (9 meters) high. Each tree is covered with green, waxy leaves growing opposite each other in pairs. Coffee cherries grow along the branches. Because it grows in a continuous cycle, it’s not unusual to see flowers, green fruit and ripe fruit simultaneously on a single tree. It takes nearly a year for a cherry to mature after first flowering, and about 5 years of growth to reach full fruit production. While coffee plants can live up to 100 years, they are generally the most productive between the ages of 7 and 20. Proper care can maintain and even increase their output over the years, depending on the variety. The average coffee tree produces 10 pounds of coffee cherry per year, or 2 pounds of green beans. All commercially grown coffee is from a region of the world called the Coffee Belt. The trees grow best in rich soil, with mild temperatures, frequent rain and shaded sun. Coffee traces its origin to a genus of plants known as Coffea. Within the genus there are over 500 genera and 6,000 species of tropical trees and shrubs. Experts estimate that there are anywhere from 25 to 100 species of coffee plants. The genus was first described in the 18th century by the Swedish botanist, Carolus Linneaus, who also described Coffea Arabica in his Species Plantarum in 1753. Botanists have disagreed ever since on the exact classification, since coffee plants can range widely. They can be small shrubs to tall trees, with leaves from one to 16 inches in size, and in colors from purple or yellow to the predominant dark green. In the commercial coffee industry, there are two important coffee species — Arabica and Robusta. 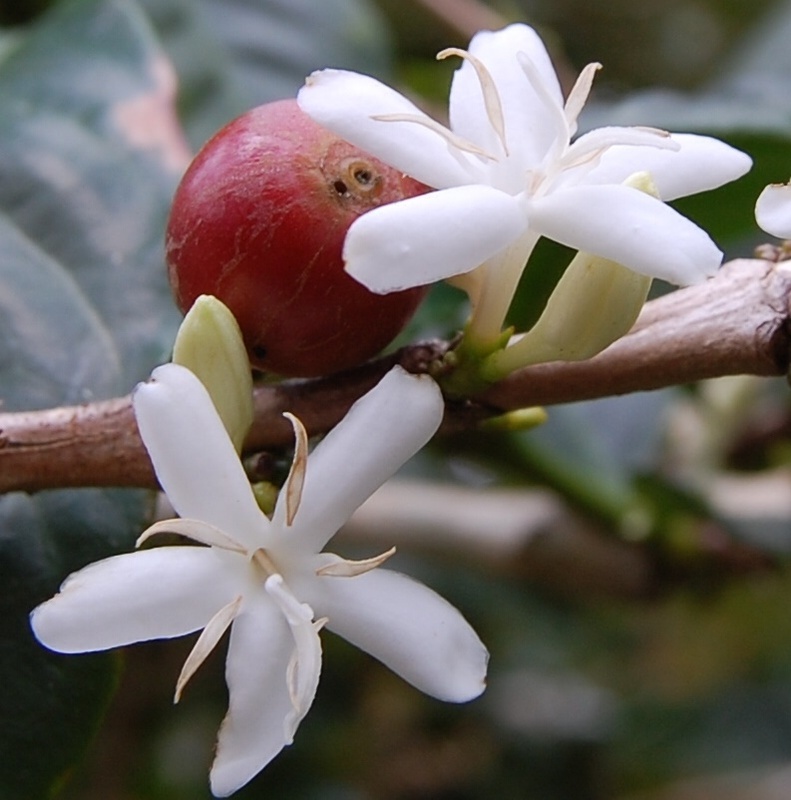 Coffea Arabica is descended from the original coffee trees discovered in Ethiopia. These trees produce a fine, mild, aromatic coffee and represent approximately 70% of the world’s coffee production. The beans are flatter and more elongated than Robusta and lower in caffeine. Most of the world’s Robusta is grown in Central and Western Africa, parts of Southeast Asia, including Indonesia and Vietnam, and in Brazil. Production of Robusta is increasing, though it accounts for only about 30% of the world market. The beans you brew are actually the processed and roasted seeds from a fruit, which is called a coffee cherry. 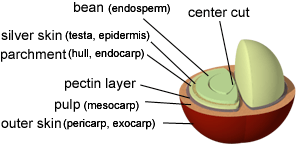 The coffee cherry’s outer skin is called the exocarp. Beneath it is the mesocarp, a thin layer of pulp, followed by a slimy layer called the parenchyma. The beans themselves are covered in a paper-like envelope named the endocarp, more commonly referred to as the parchment. Inside the parchment, side-by-side, lie two beans, each covered separately by yet another thin membrane. The biological name for this seed skin is the spermoderm, but it is generally referred to in the coffee trade as the silver skin. In about 5% of the world’s coffee, there is only one bean inside the cherry. This is called a peaberry (or a caracol, or “snail” in Spanish), and it is a natural mutation. Some people believe that peaberries are actually sweeter and more flavorful than standard beans, so they are sometimes manually sorted out for special sale.